Examples, solutions, videos, and lessons to help High School students learn how to identify the effect on the graph of replacing f(x) by f(x) + k, kf(x), f(kx), and f(x + k) for specific values of k (both positive and negative); find the value of k given the graphs. Experiment with cases and illustrate an explanation of the effects on the graph using technology. Include recognizing even and odd functions from their graphs and algebraic expressions for them. 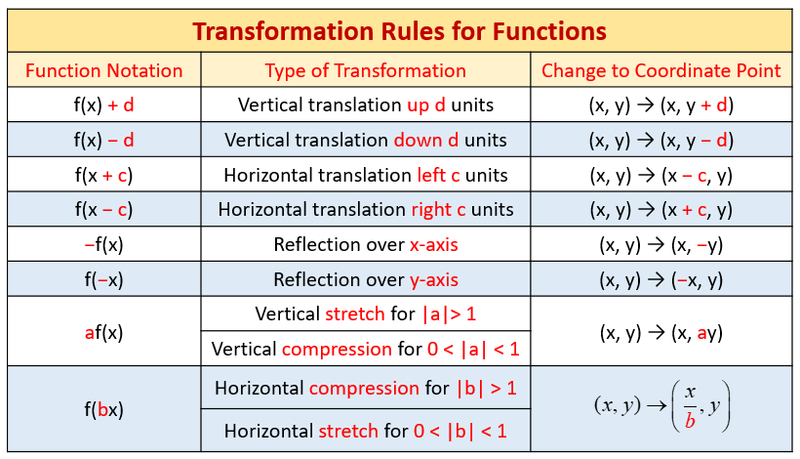 The following table gives the transformation rules for functions: Vertical and horizontal translations, Reflection over the x-axis and y-axis, Vertical and horizontal stretch, Vertical and horizontal compression. Scroll down the page for examples and solutions on how to use the transformation rules. This video explains to graph graph horizontal and vertical stretches and compressions in the form a*f(b(x-c))+d. This video looks at how a and b affect the graph of f(x). f(bx); 0 < b < 1, stretch f(x) horizontally. This video explains to graph graph horizontal and vertical translation in the form a*f(b(x-c))+d. This video looks at how c and d affect the graph of f(x). This video reviews function transformation including stretches, compressions, shifts left, shifts right, and reflections across the x and y axes. This video explains how to identify a shift up, down, left, and right given the translation in function notation.